In October 5th, there was a huge decline so it’s possible that what’s happening is a corrective downsizing in the USD index. 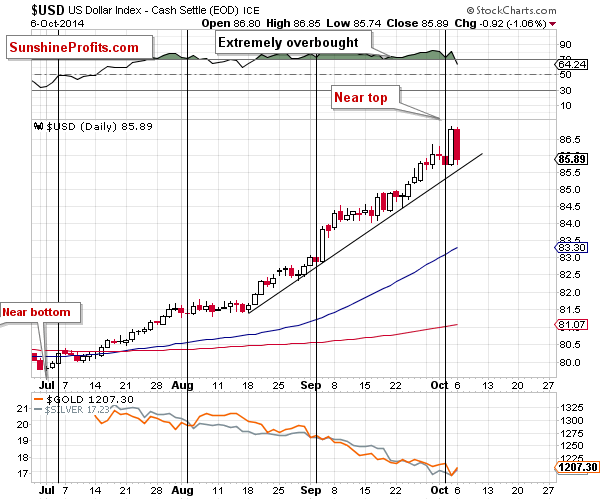 The odds of gold being on an upward scale will rise when it moves above its short-term support line. The precious yellow moving closely to its December 2013 low is an important variable in analyzing its future movements. What happened is a reverse hammer candlestick, since it rallied right after settling close to last year’s low and then moving $16 higher after the intra-day session. The reverse hammer candlestick indicates that gold will be on a bullish trend and will most likely be followed be a bigger rally in the following weeks. As for the precious white metal, it is also on an upscale trend, rising above its long-term support line. Silver is most likely going to rally based on this, combined with the precious metals market’s overbought status. Earlier in June, investment site BullionVault reports that hedge funds trading US futures and options saw an increase in bullish bets for the precious metals commodities. Investors can go long in gold, silver, and mining stocks given that price movements since the beginning of the second week of October seems positive. Gold stocks getting close to their 2013 low is a major support level for their future price movements. With a positive outlook for the precious metals’ overbought status, the future of both gold and silver, as well as the metal mining industry, seems very bullish.